CINCINNATI, Ohio -- Police have released body camera footage showing the moment a Cincinnati police officer shot a motorist during a traffic stop over a missing front license plate. 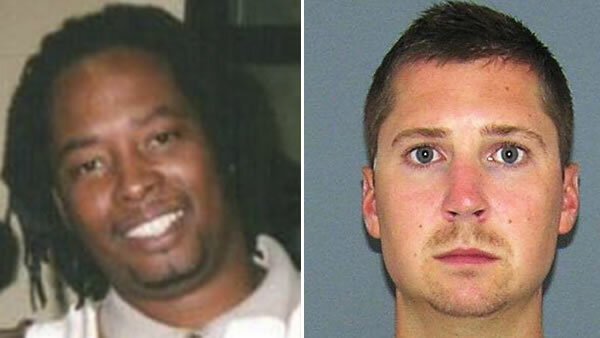 Authorities said 25-year-old Officer Ray Tensing spotted a car driven by 43-year-old Samuel DuBose and a struggle ensued after DuBose refused to provide a driver's license and get out of the car. Tensing said he was dragged by the car and forced to shoot Dubose. He fired once, striking DuBose in the head. On the footage released from Tensing's body camera video, the officer could be heard asking for DuBose's driver's license several times with DuBose saying he had one. Later, DuBose said, "But I don't think I have it on me." Tensing asks DuBose to unbuckle his seat belt. About that time Tensing pulls on the door handle, and DuBose puts his hand on the door to keep it closed. WARNING: Graphic video may be disturbing to some viewers. Then the video becomes shaky, but a gunshot can be heard and DuBose appears to be slumped in the seat before the car rolls away, coming to stop at a nearby corner. DuBose's family had pressed for release of Tensing's body camera video, and news organizations including The Associated Press had sued Hamilton County prosecutor Joe Deters to get it released under Ohio open records law, but Deters released it before any ruling was made. The Hamilton County Prosecuting Attorney has released the body camera videos of the two officers on patrol with Tensing. Officers David Lindenschmidt and Phillip Kidd were with Tensing when he shot DuBose during the traffic stop.